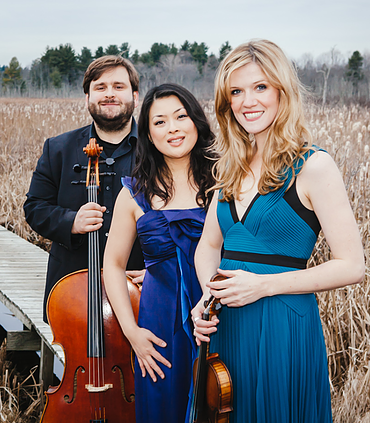 The fine young Neave Trio offered a totally fresh and invigorating concert of little-known Arthur Foote, Leonard Bernstein, and Erich Korngold on Sunday at the Center for Arts in Natick. The 1875 brick firehouse converted about a decade ago to its current purpose provides a modest sized stage and theater-seating some 200 people. The upstairs is currently being developed as a brighter and more resonant new concert space to serve for both video and chamber music events. It will open later in the fall. I gave the Neave Trio a glowing report [here] at the Rockport Festival two years ago, and expecting nothing less this time, I was eager to hear the group again because there has been a change of personnel. The original violinist and cellist, Anna Williams and Mikhail Veselov, remain, supplemented by a new pianist, Eri Nakamura. Thus the Trio now represents three continents, North America, Europe, and Asia. Williams hails from the Boston area, having attended Walnut Hill for high school and later, after studying at the Manhattan School of Music, returning to Longy for advanced studies in chamber music. Originally from St. Petersburg, Veselov too studied chamber music at Longy, where he and Anna Williams ended up in a string quartet together. They decided to found the piano trio. The Japanese-born Nakamura, who was a Tanglewood fellow last summer, is the third pianist to have played with the group. The new contingent sounds at least as brilliant as the earlier manifestation, perhaps even more so. Their unanimity, communication, variety of touch, and expressive sensibility rate first tier. Arthur Foote (1853 – 1937), one of the leading composers of the Boston romantic school of the late 19th century, continued composing well into the 20th century (his longevity caused him to be regarded as the Nestor of American composers). He carries the distinction as the first significant American composer not to have gone to Germany to finish his education. By his time, advanced musical study was possible at Harvard with John Knowles Paine. Foote was a fine pianist, though not a virtuoso; he preferred to play chamber music, which he did with many Boston groups. And he wrote a great deal of chamber music, inspired especially, it seems, by Schumann and Brahms on one hand, and Fauré on the other. His Piano Trio No. 2 in B-flat Major, Opus 65, features a vivid mazurka-like theme in the first movement (it returns in the coda of the third movement to recall this slightly folksy element). The second movement, Tranquillo, features a beautiful passage of violin legato accompanied by pizzicato cello and staccato piano, suggesting a lyric serenade accompanied by guitars (I have no idea whether guitars were used for that purpose during Foote’s student days at Harvard!). The final movement is more driven and passionate, bringing back the mazurka theme at the closer. The Neave players proved wonderfully alert to textures and colors of Foote’s romantic moods. One of the earliest compositions of Leonard Bernstein, a piano trio (designated Opus 2) composed while he was studying with Walter Piston at Harvard, completed the first half. Its surprising maturity suggests many aspects of Bernstein’s later music (bits of syncopation and jazziness, but still writing—for Piston, I assume—in a “serious” mode, with an elaborate but bluesy fugal passage for the Allegro vivace of the first movement. The second movement, Tempo di Marcia, is closer to the kind of dynamic physicality of his later writing, and the final movement, which opens with a Largo, progresses to an energetic passage not surprisingly labeled “molto ritmico.” The trio superbly projected Bernstein’s energy and drive. Korngold’s trio evokes all the warmth, schmaltz, sentimentality, and waltzing character of pre-war Vienna. The young composer seems to have heard and absorbed it all in the work of Strauss and Brahms, but he also had his own approach, modulating often in ways that struck some listeners (including his music critic father) as dangerously modern. The gold-and-purple coloration of this score achieved something quite different from that of either Foote or Bernstein, therein, the Neave players easily played with the dynamics, also showing great flexibility of tempo from moment to moment, and discovered varying timbres, singly and in combination. They encored with the gypsy rondo movement from one of Haydn’s best-known quartets, displaying brilliance and breath-taking pace. The current status of the Neave Trio is as solid as it was the last time I heard them. The works they performed on Sunday will appear on a new CD for Chandos records, due out in November.